Download "WHITE PAPER. 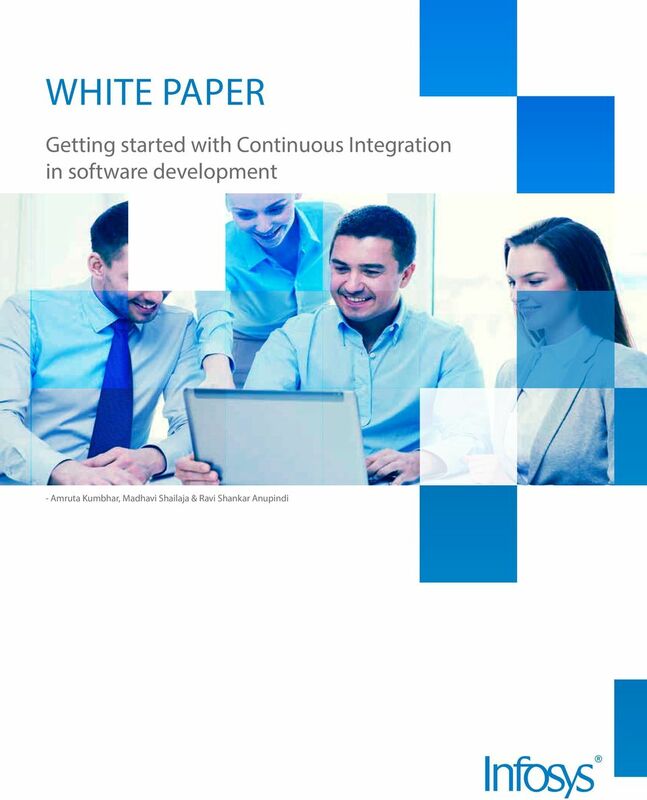 Getting started with Continuous Integration in software development. - Amruta Kumbhar, Madhavi Shailaja & Ravi Shankar Anupindi"
2 Introduction DevOps culture is gaining rapid momentum in the IT industry as it enables business to adopt agile software delivery methodologies like Continuous Integration (henceforth referred to as CI) & Continuous Delivery (henceforth referred to as CD).These methodologies enable quicker issue resolution, instant feedback loops, improved software quality and cost saving to meet the everincreasing demand to deliver better software faster. It would not be wrong to say that CI-CD practices will soon become the defacto software delivery standards across the industry. 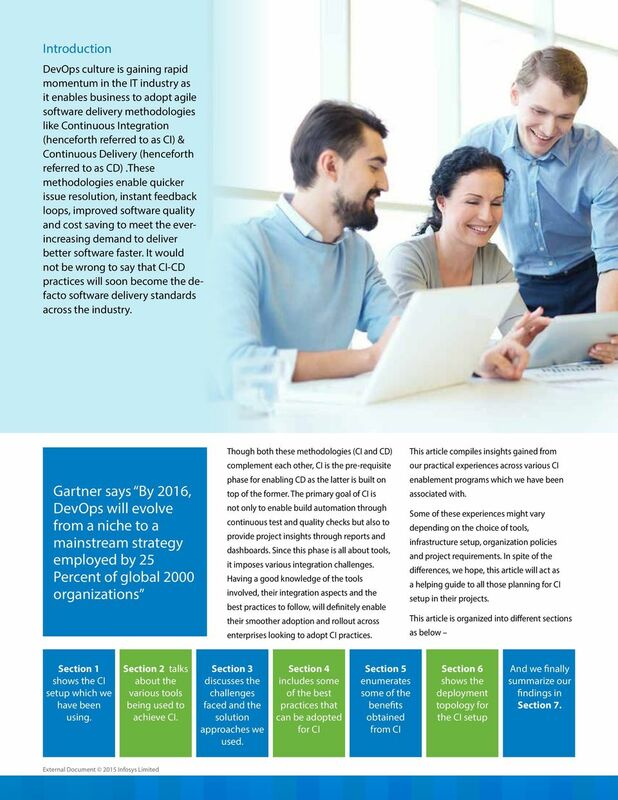 Gartner says By 2016, DevOps will evolve from a niche to a mainstream strategy employed by 25 Percent of global 2000 organizations Though both these methodologies (CI and CD) complement each other, CI is the pre-requisite phase for enabling CD as the latter is built on top of the former. The primary goal of CI is not only to enable build automation through continuous test and quality checks but also to provide project insights through reports and dashboards. Since this phase is all about tools, it imposes various integration challenges. 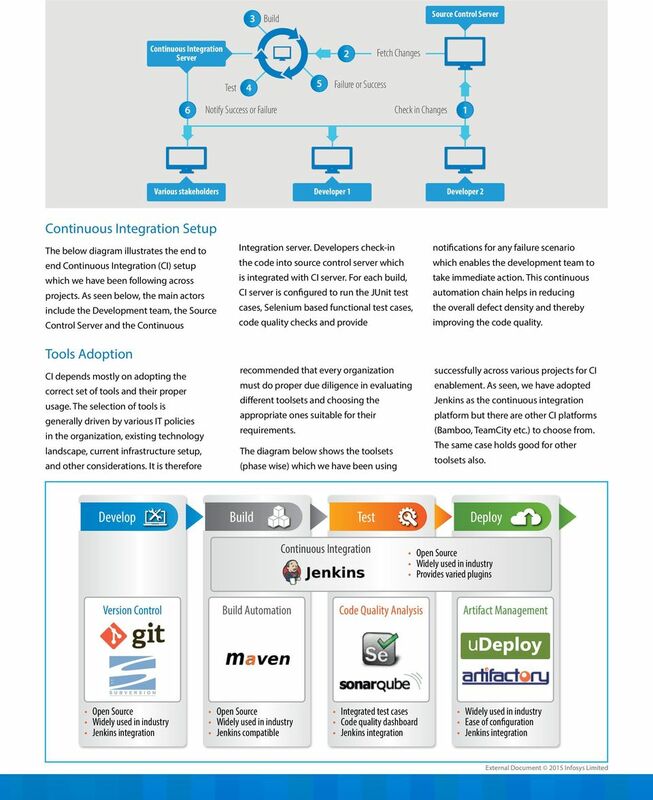 Having a good knowledge of the tools involved, their integration aspects and the best practices to follow, will definitely enable their smoother adoption and rollout across enterprises looking to adopt CI practices. 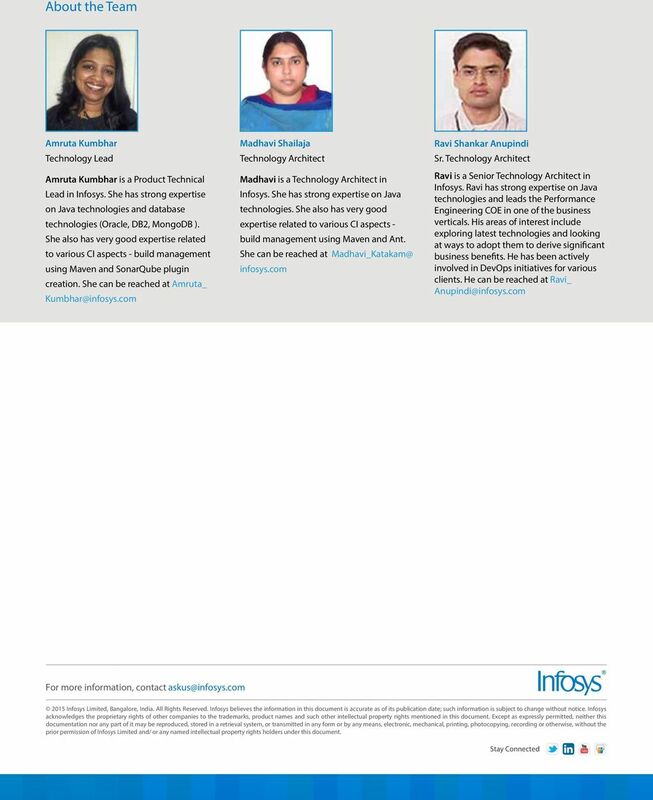 This article compiles insights gained from our practical experiences across various CI enablement programs which we have been associated with. Some of these experiences might vary depending on the choice of tools, infrastructure setup, organization policies and project requirements. In spite of the differences, we hope, this article will act as a helping guide to all those planning for CI setup in their projects. This article is organized into different sections as below Section 1 shows the CI setup which we have been using. Section 2 talks about the various tools being used to achieve CI. Section 3 discusses the challenges faced and the solution approaches we used. Section 4 includes some of the best practices that can be adopted for CI Section 5 enumerates some of the benefits obtained from CI Section 6 shows the deployment topology for the CI setup And we finally summarize our findings in Section 7. 4 Challenges Faced We faced a few challenges during our CI journey and some of the major challenges encountered are explained below. 5 Best Practices Followed After having worked on multiple CI enablement projects we have condensed together the set of best practices which we have learnt/followed. Most of these practices have been standardized and published as CI guidelines for internal usage across teams. In this section we highlight some of the best practices which we follow and would like to share with others. Role Based Access Regular cleanup of workspace & artifacts Even distribution of workload across nodes ( Even Scheduler plugin) Template based commons configuration Providing individual level access is always a cumbersome task and therefore it is recommended to provide Role-Based access Cron scripts were created to clean up the job workspace and artifacts once a week, in order to,release the memory and thereby avoid memory leak issues To overcome the default behavior of Jenkins in terms of node picking job, Even Scheduling plugin was used which ensuresd even distribution of work load across nodes Template based configuration enabled centralization of common properties across projects Benefits Realized Following are some of the benefits which we have realized by CI enablement across projects. Build Automation Code Stability Analytics CD Enablement 100% 100% 100% 100% Builds were automated by using the Poll SCM feature of Jenkins. This not only enabled faster builds but also help to eliminate manual build effort Notification feature enabled development team to respond quickly to the build failure scenarios. 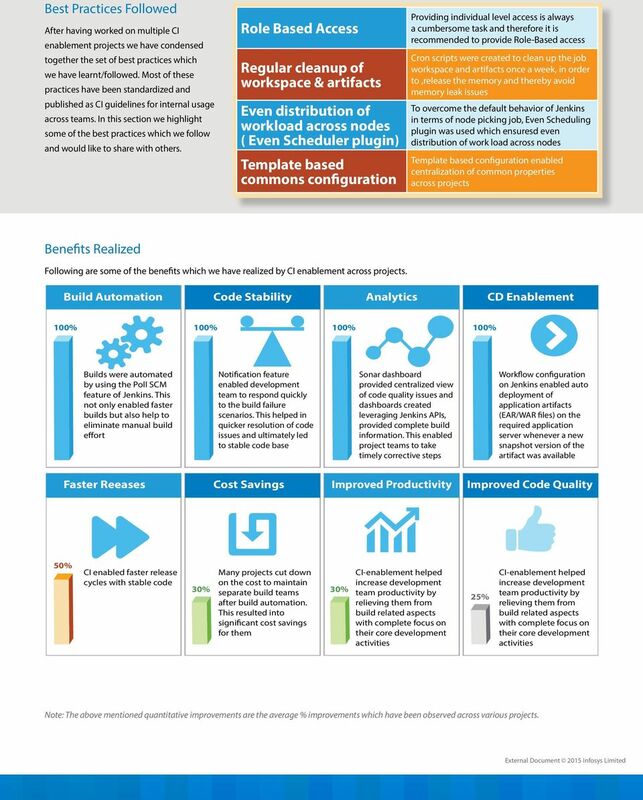 This helped in quicker resolution of code issues and ultimately led to stable code base Sonar dashboard provided centralized view of code quality issues and dashboards created leveraging Jenkins APIs, provided complete build information. This enabled project teams to take timely corrective steps Workflow configuration on Jenkins enabled auto deployment of application artifacts (EAR/WAR files) on the required application server whenever a new snapshot version of the artifact was available Faster Reeases Cost Savings Improved Productivity Improved Code Quality 50% CI enabled faster release cycles with stable code 30% Many projects cut down on the cost to maintain separate build teams after build automation. This resulted into significant cost savings for them 30% CI-enablement helped increase development team productivity by relieving them from build related aspects with complete focus on their core development activities 25% CI-enablement helped increase development team productivity by relieving them from build related aspects with complete focus on their core development activities Note: The above mentioned quantitative improvements are the average % improvements which have been observed across various projects. 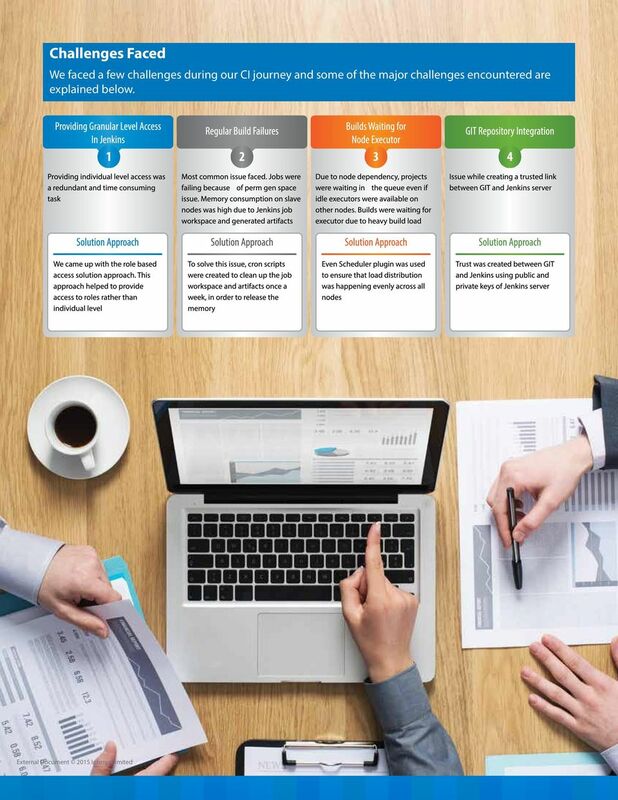 Evaluation Framework: To Build or to Buy CRM Software? ADVANTAGE YOU. Be more. Do more. With Infosys and Microsoft on your side! 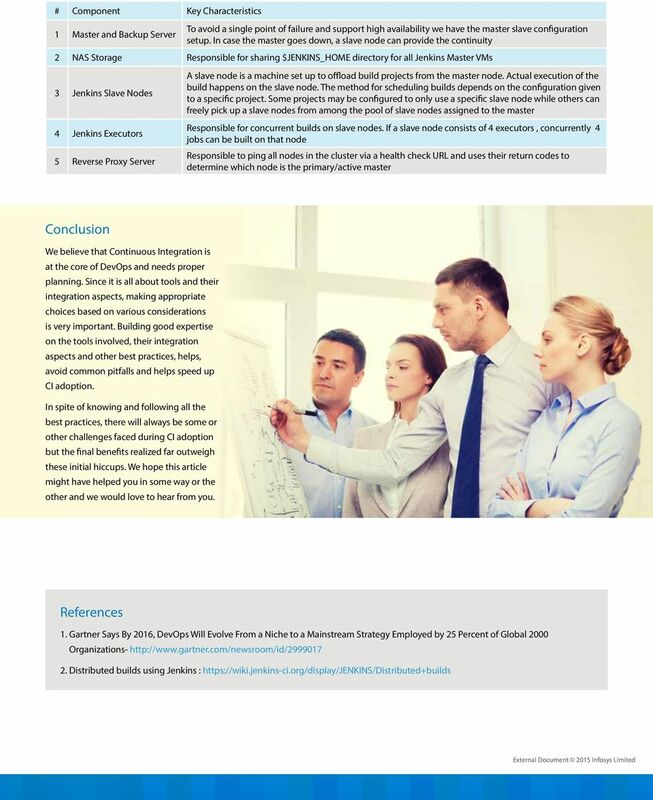 WHITEPAPER Automation in environment management: A wellspring of efficiency Abstract Agility is the key for the IT function in an organization to be able to respond quickly to changing business conditions. perspective Customer Relationship Management Solutions for effective Customer & Dealer Management Abstract Large numbers of OEMs / auto manufacturers are looking for integrated ways to manage their customers. Windows Server 2012: Storage. Module 3 - Introduction to Cluster Shared Volumes and CSV Architecture.